This article is about the novel character. For other uses, see Big Brother (disambiguation). In the essay section of his novel 1984, Anthony Burgess states that Orwell got the idea for the name of Big Brother from advertising billboards for educational correspondence courses from a company called Bennett's during World War II. The original posters showed J. M. Bennett himself, a kindly-looking old man offering guidance and support to would-be students with the phrase "Let me be your father." According to Burgess, after Bennett's death, his son took over the company and the posters were replaced with pictures of the son (who looked imposing and stern in contrast to his father's kindly demeanor) with the text "Let me be your big brother". Additional speculation from Douglas Kellner of the University of California, Los Angeles argued that Big Brother represents Joseph Stalin. Another theory is that the inspiration for Big Brother was Brendan Bracken, the Minister of Information until 1945. Orwell worked under Bracken on the BBC's Indian Service. Bracken was customarily referred to by his employees by his initials, B.B., the same initials as the character Big Brother. Orwell also resented the wartime censorship and need to manipulate information which he felt came from the highest levels of the Minister of Information and from Bracken's office in particular. In the novel, it is never made clear whether Big Brother is or had been a real person, or is a fictional personification of the Party, similar to Britannia and Uncle Sam. Big Brother is described as appearing on posters and telescreens as a man in his mid-40s. In Party propaganda, Big Brother is presented as one of the founders of the Party, along with Goldstein. At one point, Winston Smith, the protagonist of Orwell's novel, tries "to remember in what year he had first heard mention of Big Brother. He thought it must have been at some time in the sixties, but it was impossible to be certain. In the Party histories, Big Brother figured as the leader and guardian of the Revolution since its very earliest days. His exploits had been gradually pushed backwards in time until already they extended into the fabulous world of the forties and the thirties, when the capitalists in their strange cylindrical hats still rode through the streets of London". In the book The Theory and Practice of Oligarchical Collectivism, read by Winston Smith and purportedly written by Goldstein, Big Brother is referred to as infallible and all-powerful. No one has ever seen him and there is a reasonable certainty that he will never die. He is simply "the guise in which the Party chooses to exhibit itself to the world" since the emotions of love, fear and reverence are more easily focused on an individual (if only a face on the hoardings and a voice on the telescreens) than an organisation. When Winston Smith is later arrested, O'Brien repeats that Big Brother will never die. When Smith asks if Big Brother exists, O'Brien describes him as "the embodiment of the Party" and says that he will exist as long as the Party exists. When Winston asks "Does Big Brother exist the same way I do?" (meaning is Big Brother an actual human being), O'Brien replies "You do not exist" (meaning that Smith is now an unperson; an example of doublethink). At this moment the entire group of people broke into a deep, slow, rhythmic chant of 'B-B! . . . B-B! . . . B-B! '—over and over again, very slowly, with a long pause between the first 'B' and the second—a heavy murmurous sound, somehow curiously savage, in the background of which one seemed to hear the stamps of naked feet and the throbbing of tom-toms. For perhaps as much as thirty seconds they kept it up. It was a refrain that was often heard in moments of overwhelming emotion. Partly it was a sort of hymn to the wisdom and majesty of Big Brother, but still more it was an act of self-hypnosis, a deliberate drowning of consciousness by means of rhythmic noise. Though Oceania's Ministry of Truth, Ministry of Plenty and Ministry of Peace each have names with meanings deliberately opposite to their real purpose, the Ministry of Love is perhaps the most straightforward as "rehabilitated thought criminals" leave the Ministry as loyal subjects who have been brainwashed into adoring (loving) Big Brother, hence its name. Like the Nazi salute, Ingsoc has its own salute to Big Brother, which consists of crossing one's arms above the head during Two Minutes Hates and Hate weeks, showing loyalty to Big Brother and the Party. Note that it is only mentioned and shown in the movie adaptation of the novel. Since the publication of Nineteen Eighty-Four, the phrase "Big Brother" has come into common use to describe any prying or overly-controlling authority figure and attempts by government to increase surveillance. Big Brother and other Orwellian imagery are often referenced in the joke known as the Russian reversal. The magazine Book ranked Big Brother No. 59 on its 100 Best Characters in Fiction Since 1900 list. Wizard magazine rated him the 75th greatest villain of all time. The worldwide reality television show Big Brother is based on the novel's concept of people being under constant surveillance. In 2000, after the United States version of the CBS program Big Brother premiered, the Estate of George Orwell sued CBS and its production company Orwell Productions, Inc. in federal court in Chicago for copyright and trademark infringement. The case was Estate of Orwell v. CBS, 00-c-5034 (ND Ill). On the eve of trial, the case settled worldwide to the parties' "mutual satisfaction", but the amount that CBS paid to the Orwell Estate was not disclosed. CBS had not asked the Estate for permission. Under current laws, the novel will remain under copyright protection until 2020 in the European Union and until 2044 in the United States. The iconic image of Big Brother (played by David Graham) played a key role in Apple's "1984" television commercial introducing the Macintosh. The Orwell Estate viewed the Apple commercial as a copyright infringement and sent a cease-and-desist letter to Apple and its advertising agency. The commercial was never televised again, though the date mentioned in the ad (24 January) was but two days later, making it unlikely that it would have been re-aired. Subsequent (now posthumous) ads featuring Steve Jobs (for a variety of products including audio books) have mimicked the format and appearance of that original ad campaign, with the appearance of Jobs nearly identical to that of Big Brother. In 2008, The Simpsons spoofed Apple's Big Brother commercial in an episode entitled "Mypods and Boomsticks". The December 2002 issue of Gear magazine featured a story about technologies and trends that could violate personal privacy moving society closer to a "Big Brother" state and utilised a recreation of the movie poster from the film version of 1984. Computer company Microsoft patented in 2011 a product distribution system with a camera or capture device that monitors the viewers that consume the product, allowing the provider to take "remedial action" if the actual viewers do not match the distribution license. The system has been compared with 1984's telescreen surveillance system. A series of laws intended to implement the European Union Data Retention Directive in Romania were nicknamed "the Big Brother laws" by Romanian media and civil society as they would have led to blanket storage of citizens' telecommunications data for six months. All of these laws were struck down as unconstitutional by the Constitutional Court of Romania and the Directive itself was ultimately invalidated by the Court of Justice of the European Union. In the 2010 video game Bioshock 2, there is an enemy named the Big Sister. The phrase "Big Sister is watching" is a reference to the 1984 phrase "Big Brother is watching". Wikimedia Commons has media related to Big Brother. ^ "Douglas Kellner, George F. Kneller Philosophy of Education Chair, UCLA". ucla.edu. Archived from the original on 9 July 2011. ^ "From 1984 to One-Dimensional Man: Critical Reflections on Orwell and Marcuse" (PDF). Archived from the original (PDF) on 29 August 2011. ^ Orwell, George (1949). Nineteen Eighty-Four. ^ Christine Paik (19 March 2002). "100 Best Fictional Characters Since 1900". NPR. Retrieved 8 September 2013. ^ Farrell, Nick (9 October 2009). "Steven Jobs is the new Big Brother". the Inquirer. ^ Gianatasio, David (16 December 2010). "Steve Jobs (once again) cast as Big Brother". AdWeek. ^ Siegler, MG (1 December 2008). "The Simpsons Apple spoof likely has many wondering what a "myCube" is". VentureBeat. 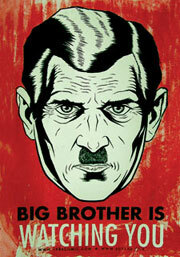 ^ "Big Brother is Watching You – George Orwell 1984 Movie Prop Print DallmeierArt.com". Archived from the original on 10 February 2010. ^ "Content distribution regulation by viewing use". Appft.uspto.gov. Retrieved 1 January 2013. ^ Evans, Robert (12 November 2012). "Kinect Makes 1984 Reality: Well, one part anyway". I4u.com. Archived from the original on 9 November 2012. .
^ "Traian Basescu a promulgat asa numita 'lege Big Brother' care prevede stocarea pentru sase luni a datelor de trafic ale tuturor utilizatorilor de telefonie si internet".